You are here: Home / Reviews / Book and Product Reviews / The Abundance Diet | Review + Recipe! If you are familiar with and follow vegan blogs like I do, you’ve no doubt seen and read about Somer McCowan of Vedged Out‘s inspirational, plant-based story. If not, check it out here. Somer is a super-enthusiastic, super-sweet person who creates gorgeous vegan and mostly gluten-free recipes. I love her style, welcoming spirit and fun approach to food. Last winter, Somer told me I should join Instagram, and I was like, hmm, I don’t know … but signed up after that and now I love it … thanks Somer! 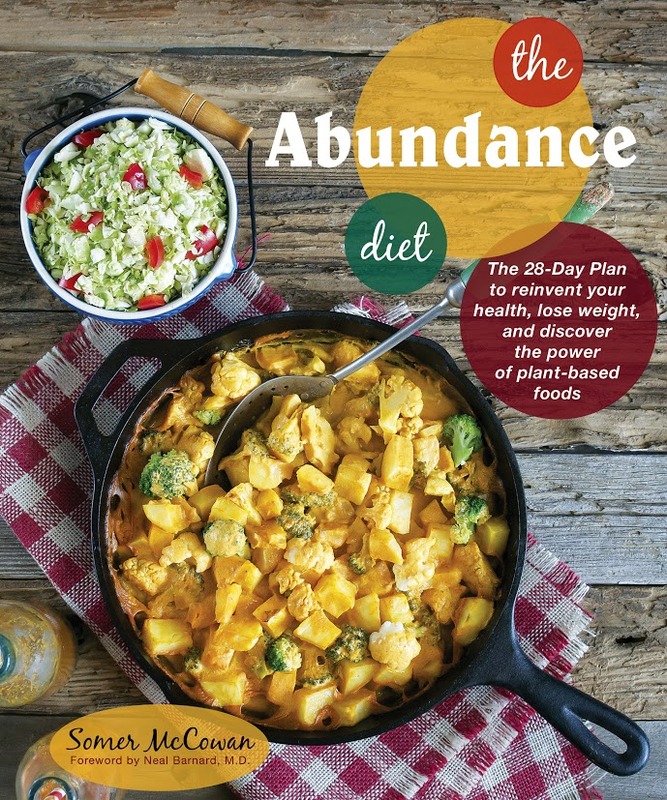 Most recently, Somer has come out with a cookbook called The Abundance Diet. When Somer reversed her severe ulcerative colitis through a plant-based diet, she revitalized her health through eating in a way that not only kept her feeling full without counting calories, but also eliminated bad cholesterol and helped her blood pressure. The Abundance Diet is a reflection and celebration of that journey, and champions eating nutrient-dense plants to reinvent and improve health. With meal plan menus, fitness tips and ways to maintain this new lifestyle, The Abundance Diet is approachable, welcoming and offers gorgeous recipes designed to keep you feeling full between mealtimes. With recipes like bbq tofu and avocado spring rolls, raw pad thai, oil-free goddess dressing, raw cashew horchata and chocolate chip mini-blondie muffins, Somer shows that eating low-fat and plant-based is not at all boring, but rather full of possibilities and abundant with vibrant colors and amazing flavors. 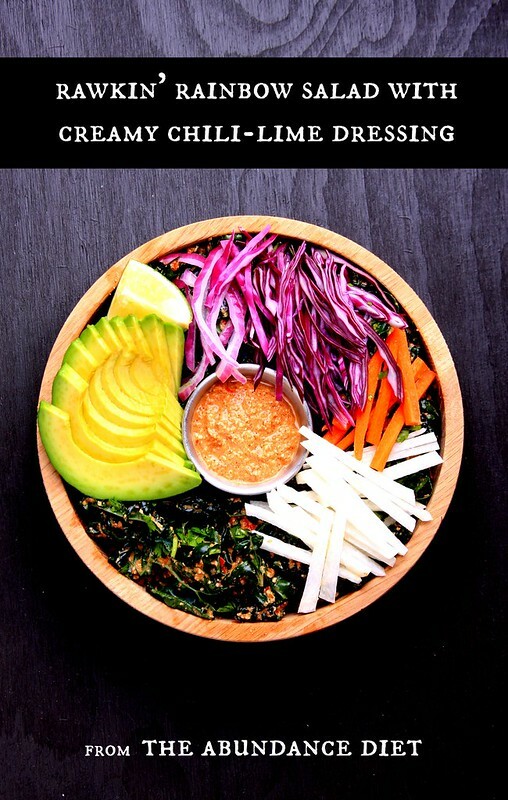 And speaking of gorgeous colors, I first made Somer’s rawkin’ rainbow kale salad with creamy chili lime dressing. It was super fresh (take a look at all of the colorful and flavorful components below! ), super tasty and we loved it! So I’m happy that the publisher, Vegan Heritage Press, is allowing me to share the recipe here with you … enjoy! Recipe from The Abundance Diet, © 2015 by Somer McCowan. Used by permission from Vegan Heritage Press LLC. I call this “a salad for the kale haters” because my husband, who isn’t fond of kale, asked for seconds on this incredibly lush and dreamy salad. 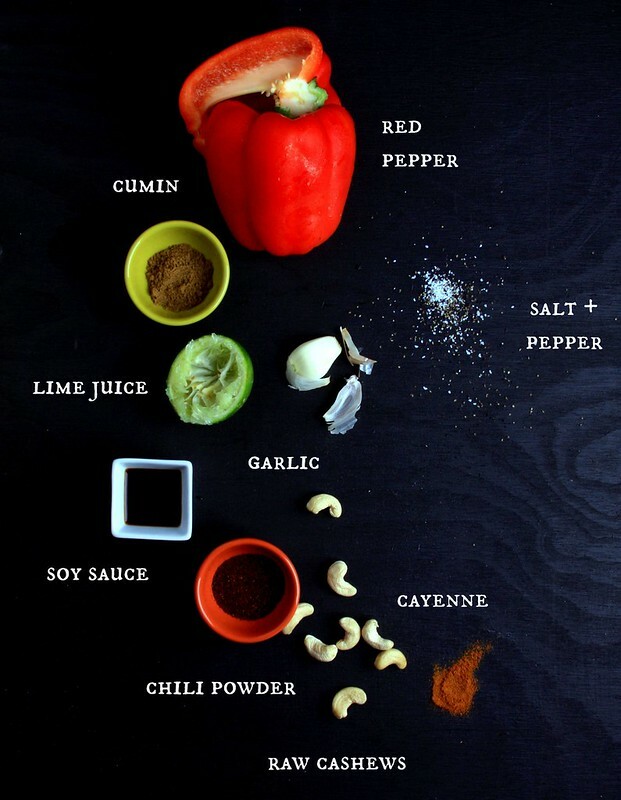 In a high-speed blender or a food processor, combine the red bell pepper, garlic, cashews, tamari, lime juice, chili powder, cumin, cayenne, salt, and pepper. Blend until completely smooth and creamy, 1 to 2 minutes. Transfer the kale and the cilantro to a large salad bowl and pour on the dressing. Toss until all the kale is thoroughly coated, then massage the kale with your hands for 1 to 2 minutes. (Massaging kale makes it taste better!) 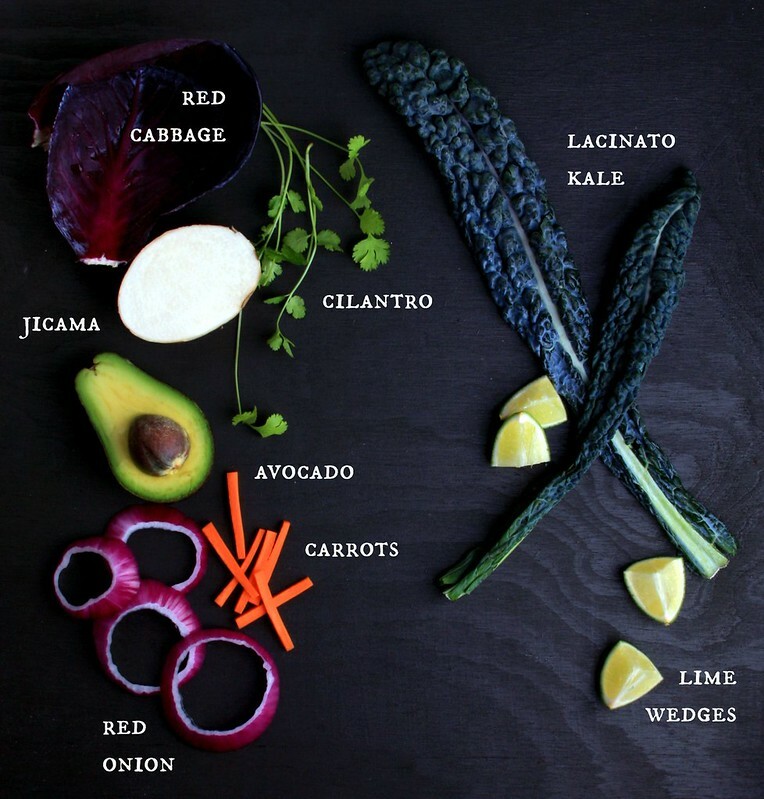 Divide the kale salad among four large plates and top with the purple cabbage, red onion, carrot, avocado, and jicama. Season with a bit of salt and pepper and serve with lime wedges, if desired.